We recently indulged ourselves in a Big City hunting and gathering trip, stocking up on supplies not commonly found in our neck of the woods. Pedro Ximenez and Oloroso sherry from the Spanish Table, Sichuan preserved vegetable from Ping’s (finally identified by learning the Chinese words for it, cha choy), gochujang, curry leaves, Indian bitter melon, sea beans (also called samphire or glasswort) and noodles from Uwajimaya, and Toulouse sausage from the Paris Grocery. The bitter melon molded within a day and had to be composted (darn it), so the night which had been slated for curry suddenly had to be re-planned. 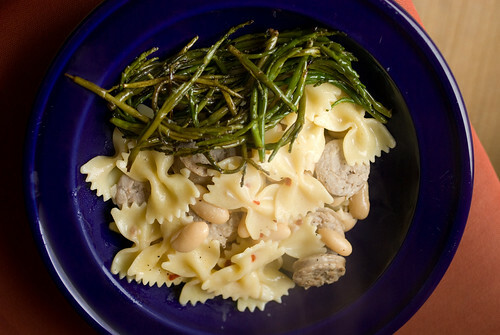 The main dish I came up with was simple – farfalle pasta tossed with garlic, chile, white beans and the sausage, which I seared in a skillet and cut into rounds. 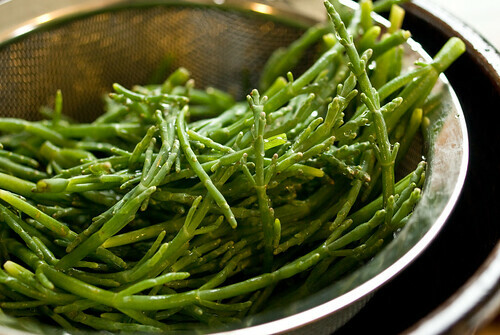 For the sea beans I took a flavor concept from the Zuni Cookbook, sauteeing them in butter and finishing them with a splash of sherry vinegar. Sea beans are so salty no other seasoning was needed, and the vinegar was a perfect complement. I think this was my favorite way of eating sea beans so far.